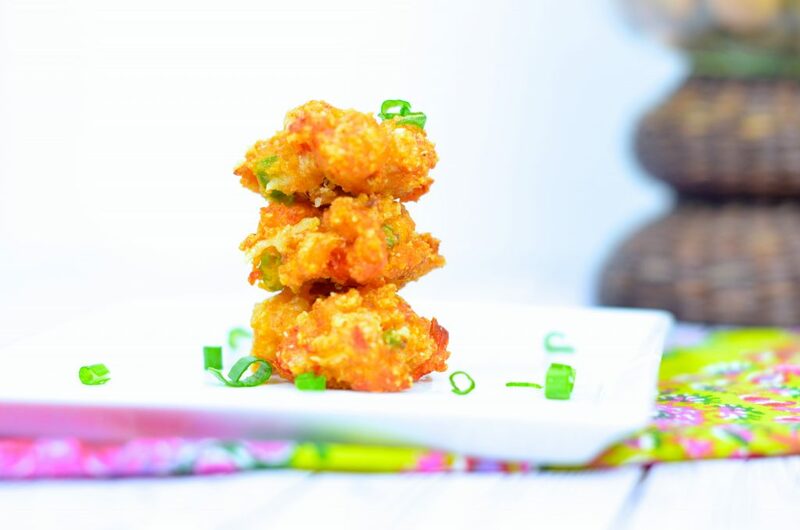 A low carb, keto friendly, gluten free crawfish beignet the entire family will love! Perfect for carnival season! Question time! What is your favorite way to eat crawfish? This girl loves to have her crawfish boiled. I am lucky enough to have grown up with this amazing Louisiana seafood, but my Yankee husband (ok, he insist he is from the Midwest) did not. The art of boiled crawfish is a religion in South Louisiana. Literally after Christmas, we start pinning in our calendar the the start of crawfish season. No longer we need to call businesses, we can download trust apps to compare crawfish prices. Greg (my Yankee husband) experienced his first real crawfish boil in my hometown of Houma, LA. With the newspaper spread out on the table and the crawfish being poured from the pot, my family grabbed our plastic crawfish trays and started digging in while my husband looked a little confused. Then it happened….. The gloves. Yes, he pulled his gloves (he is a physical therapist) out of his pocket and began to politely peel his crawfish. The room turned silent. Thankfully, my sweet family was nice about his gloves, and we taught him the proper way to peel crawfish. Fifteen years later, Greg is a pro and no longer needs gloves and both our kids love the taste of crawfish. Christian (my 5 year old) loves crawfish so much, he has a namesake recipe in my first cookbook, Skinny Louisiana…in the Kitchen), Christian’s Crawfish Casserole. While boiled crawfish is typically the answer of most when discussing crawfish, we have some really fun crawfish dishes at our local restaurants including Emeril’s famous crawfish bread, crawfish etouffee, and crawfish beignets. Who doesn’t love a beignet? 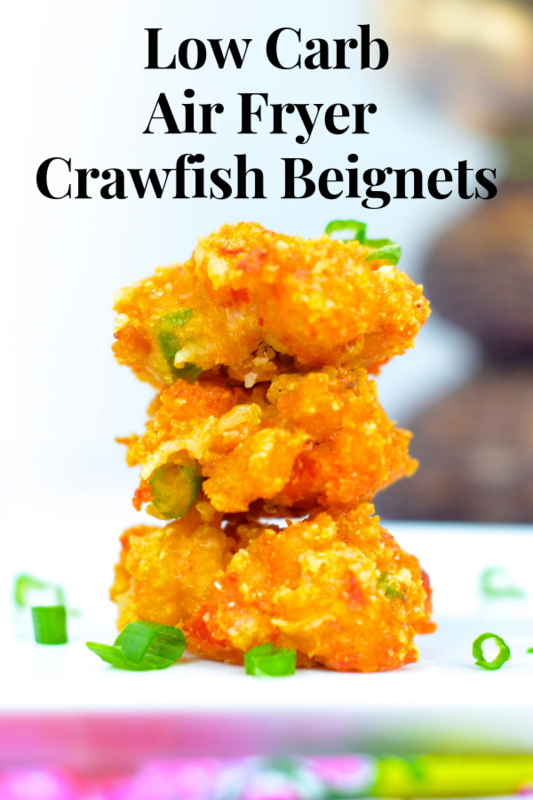 Most of us think of Cafe du Monde’s sweet beignet with powdered sugar (I am working on making this low carb), crawfish beignets or crawfish balls take a spin on the beignet turning it into a savory appetizer. I went to my drawing board to develop a low carb air fryer recipe using my Phillips Air Fryer. 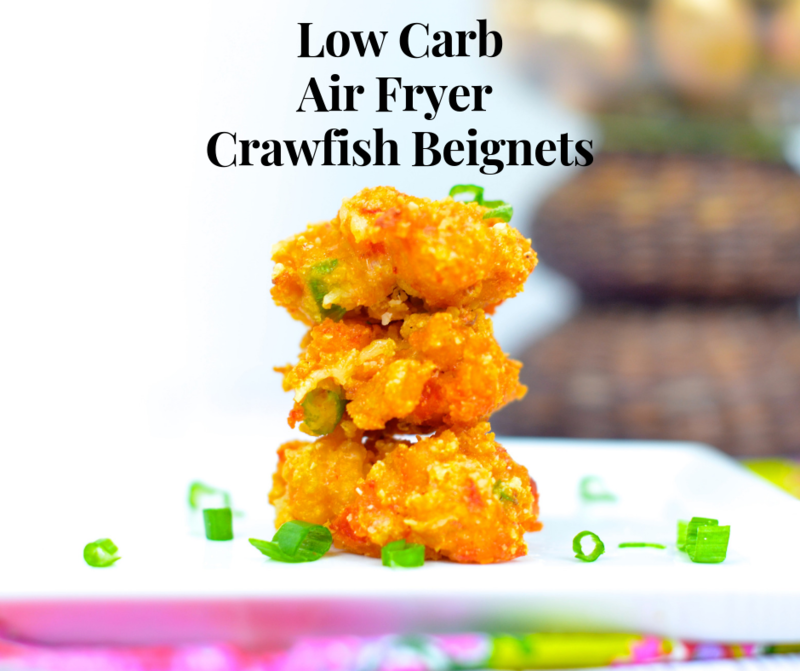 The result is an amazing low carb keto friendly air fryer crawfish beignet the entire family will love. I hope you and your family will enjoy it as much as mine does! With any beignet, flour is the basic ingredient. It serves several purposes, mainly as a thickening agent and to hold the wet ingredients together. Flour in the low carb and low net carb world makes us cringe since whole wheat flour has 21 grams of carbs and 3 grams of fiber per 1/4 cup serving. Enter almond flour! Almond flour is made of almonds that have been ground to a fine texture. It is a gluten free, keto friendly, grain free food and contains approximately 5-6 grams of carbs per 1/4 cup. Don’t panic over the carbs, almond flour has approximately 3 grams of fiber giving this flour a net carb of 3 per serving. And please don’t panic over the fat. Remember nuts are the fats we want to include in our diet. I do enjoy cooking with almond flour, but I personally feel due to it’s heavier texture, almond flour works best in bars, brownies, and muffins as well as in my batters for my vegetables and meats in the air-fryer. Almond flour makes a great low carb bread crumb when combined with grated Parmesan cheese. Please note, the type of almond flour does matter. Make sure to use super-fine almond flour from balanced almonds. We used Bob’s Mill Almond Flour in this recipe. You can purchase online here! We love eggs in the Skinny Louisiana kitchen. Eggs offer us an amazing source of protein with zero carbs. While my keto friends will ask about using a whole egg, I prefer the egg white in recipes using the Air Fryer. Pull out your cutting board and chop one pound of this awesome Louisiana seafood with a sharp knife. Place aside. Using a separate small cutting board, chop the green onions. Place crawfish and green onions in a…. In a large bowl, combine crawfish, green onions, egg whites, almond flour, extra virgin olive oil, Tony Chachere’s lite, pepper, garlic powder, and grated parmesan cheese. Using a spatula combine mixture until all ingredients are mixed. 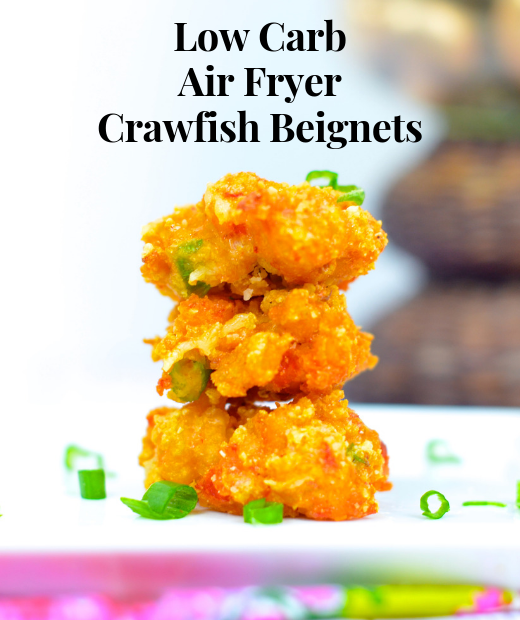 Using a small ice cream scoop or tablespoon, drop crawfish beignet batter into Air Fryer basket. NOTE – Do not make the scoops or spoonful ‘spilling’ over the spoon. The larger the beignet you make, the longer it will take to cook. Spray basket with non-stick cooking spray (yes, over the crawfish beignets) and close basket. Set temperature at 330 degrees. Cook 8 minutes. At end of 8 minutes, check level of doneness. Depending on your desire of crispness, you can cook for an additional 2-5 minutes. In a large bowl, combine all ingredients. Stir until well blended. 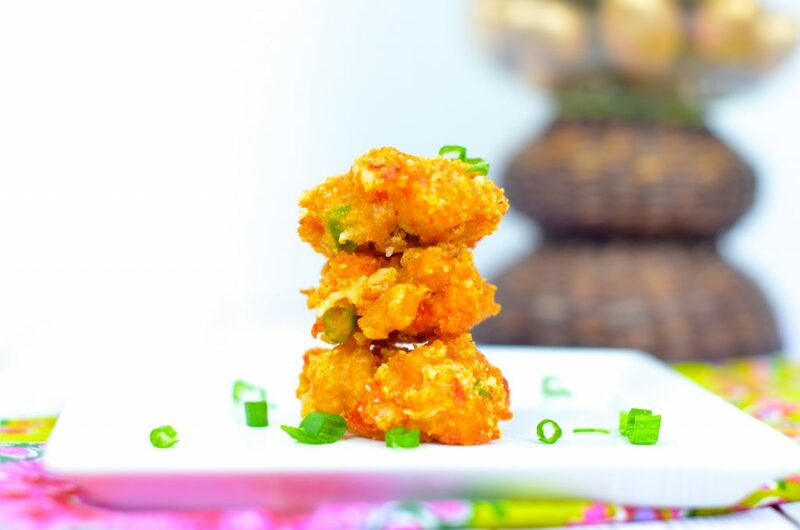 Using a small ice cream scoop or tablespoon, drop tablespoonfuls of crawfish batter in Air Fryer basket. When basket is full, spray again with non-stick cooking spray. Place basket in AIr Fryer. Set temperature at 330 degrees. Cook for 8 minutes. Open basket and check for doneness. If more of a crispy product is desired, return basked to Air Fryer and cook for 2-5 more minutes. Remove basket. Remove beignets using a small rubber spatula. Calories: 35, Total fat: 2g. Saturated fat: 0g, Cholestertol: 25mg, Sodium: 85mg, Total carbs: <1g, Fiber: 0g, Protein: 4g.